When I was taking stock of my sewn wardrobe (which is very easy to do when you’re packing it all up! ), I noticed I have quite a few separates. In the last year I’ve made three skirts and 1 pair of trousers (with more trousers on the way). 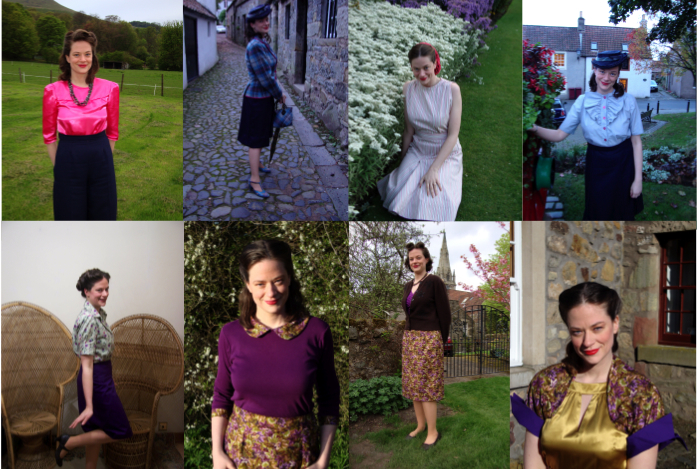 However, I only have two vintage blouses I’ve made (and a dickey)! My normal ready to wear wardrobe is the opposite. I have very few trousers (all in classic colors) and TONS of blouses and tops for both work and after work occasions. I wanted a super fun way to add blouses to my wardrobe and had been chatting about a sewing challenge for the New Year with Sarah from Rhinestones and Telephones. We will be co-hosting the Sewing through the Decades Challenge. 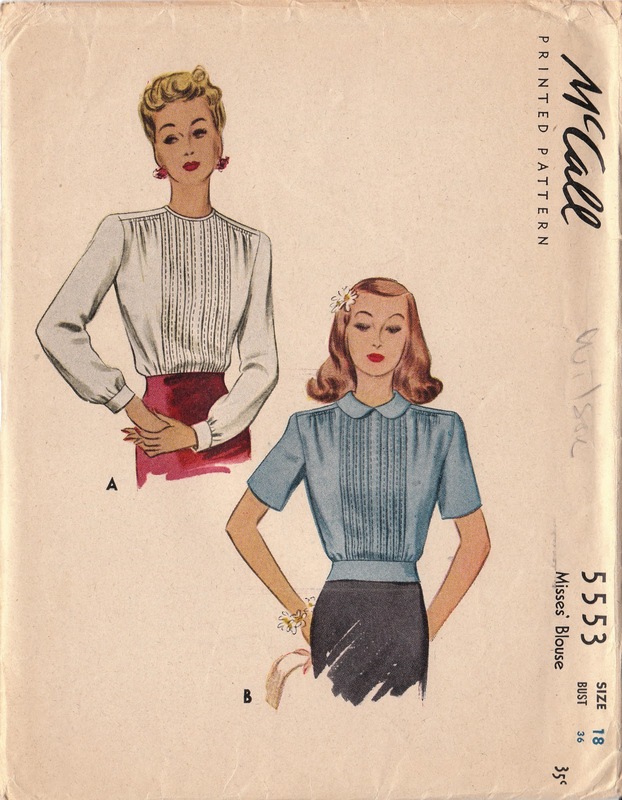 I am going to sew up a blouse from each year of 1931-1949. Yup, that’s 20 blouses—each from their own specific year! Plus, I am planning a bunch of bonus blouses as well (hello Pendrell pattern!). By the end of this challenge, I will have an almost complete wardrobe of separates! Why don’t you join along? This isn’t a sew-along (as there are a lot of great sew-alongs happening at the moment), so you can do your own thing. You can go as fast or as slow as you want (no deadlines). And you can sew however many things you want. The basic thought is to challenge yourself to explore different time periods (which can be three years in one decade—1943, 1944, 1945) or several patterns across several decades (50’s, 60’s, 70’s). 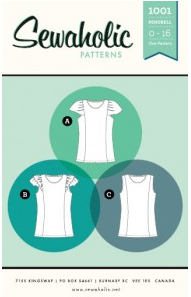 You can sew blouses, skirts, dresses, trousers…whatever you want! It will be fun to share our experiences in sewing from different time periods. The patterns can span both vintage and modern years. I’m going to be tying my sewing through the decades challenge along with my sew weekly posts as much as I can. I’m also going to try and experiment with lots of different types of fabrics. 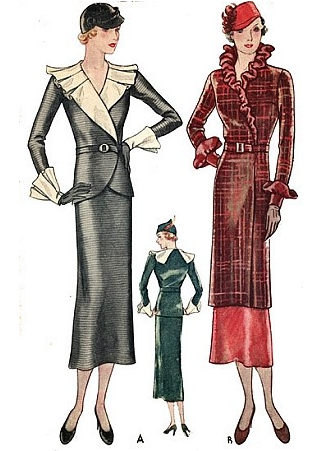 Here are a few of the patterns I’m planning on making as part of the Sewing Through the Decades Challenge. The blouses I have chosen from the 30's will definitely be more time intensive...but the details, oh the details of the outfits from then! LOVE them! Ohhhh, I am so excited! I am really excited to explore all the different years and to come up with some great separate pieces for my sewn wardrobe! What lovely garments you have in your queue! I have the Pendrell blouse in mine too! I hope you are enjoying Edinburgh, I've been living here for about a year and a half and love it! Interesting sewalong and tempting, but my new year resolution was... you guessed it... no sewing along. I'm setting my own projects and sticking with them. Yay! I've been hunting for a vintage sew along, so you had better count me in! What a cool idea, I'll be looking forward to seeing what you make. The 30's are ridiculously labor intensive at times, but you're right- so worth it. I'd be concerned about finding that many patterns... So many 30's patterns are hard to date, and they can be hard to come by (though you live in an older place than I, so maybe not...). I'll be watching every project with anticipation as I'm a big fan of separates. If I wasn't pregnant I would sew-a-long for sure! I'll really look forward to seeing what you both make. Great idea! And I really, really, really love the outfit you have planned for Valentine's Day - it is stunning. Oooh, some lovely patterns there! Look forward to seeing how you get on. Ooo! This sewing through the decades challenge sounds like so much fun! I'd love to join in, although my goals are going to have to be less ambitious than yours for now. I'm really going to have to see if I can find a copy of that hooded jacket pattern from 1940. That's one of the cutest things I've ever seen! This sounds really fun and low pressure. 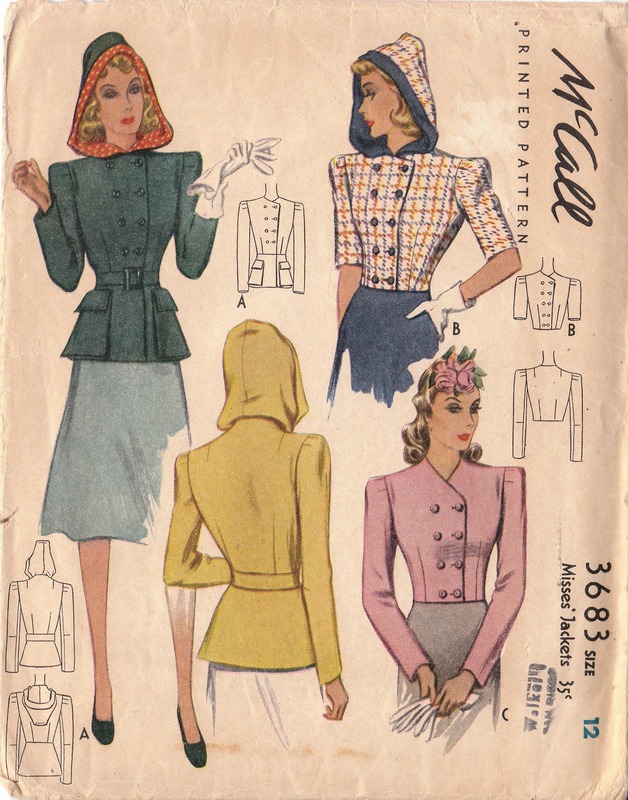 No commitments from me right now, but I just bought some vintage patterns, so we'll just have to see what happens. I LOVE the Valentines blouse you've chosen! I can't wait to see your finished products, those patterns are divine! I'm so excited to see what you're doing! I'm super low on blouse options and will gleefully steal ideas! That Valentines shirt is wonderful! Oh jeez, like I need more projects! But this one looks horribly tempting as well. Gah! Ack! *Want* Mccall 3683!! That is amazing! I'm with Lauren - amazing pattern! Please enter me for both! I follow Lauren's blog, and she led me to you! I love your blog as well. Not much time to sew, but I can dream can't I? Oh now that looks interesting. I think I'll be watching and unofficially sewing along - my sewing time is rather limited and I tend to do a fast/feast thing, but I'm really interested. Oh wow--what a brilliant idea to sew all those blouses. I am experiencing my seasonal-adoration of 30s stuff right now (somehow I always want frilly, filmy things in the dead of winter--go figure! ;) and am particularly dying to see your 30s blouses. The Challenge sounds so neat. I admit I am up to my eyeballs in projects right now (aside from all the ones I've been posting about online, there are a couple "hush-hush" ones ;), but shall keep it in mind for something to opt into later in the spring. Best of luck with your challenge! What a great idea! Whether I 'officially' join or not, it sounds like what I've already been intending to do anyway, since I only plan on sewing with vintage patterns this year, in an effort to really get myself sewing frequently. Of course I have many vintage patterns that I don't know the date of, as there doesn't appear to be anything printed anywhere. Perhaps I'll investigate if there's a resource out there somewhere to help with that. I'll have to think about this! Wonderful idea! I will sew along with you! I don't know if I can find patterns for each year, but I absolutely love your plan. My 30s patterns are lacking. :( But...that just means more shopping! haha! 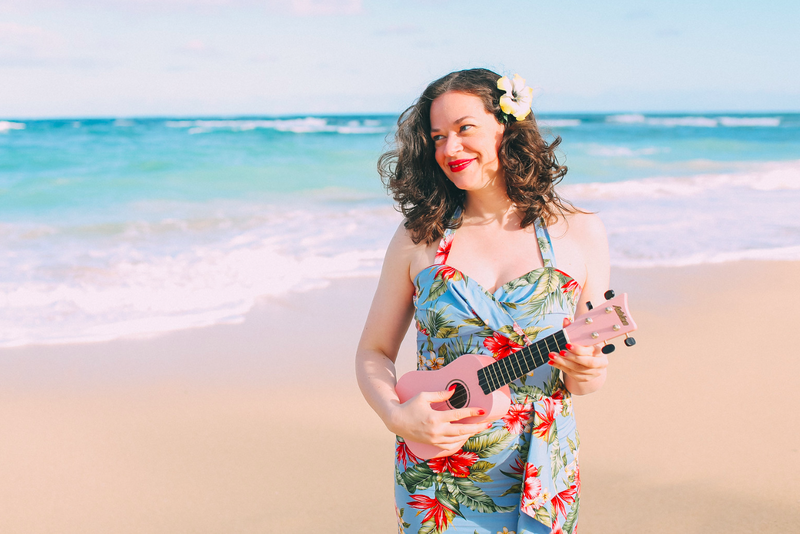 I'm adding your button to my blog now! Love the valentines day seperates idea, I have had that one in my inspiration folder for ages too! I am so in! Although I won't be able to start until feb. Still working on my Korea dress! count me in too! so inspired by your lovely work! I had a similar idea. But instead of using commercial patterns, I would draft ones out of books. My first dress is a 1950's dress with the pattern provided by the V and A museum. Its been a challenge so far just to get the pattern together. Debi, I love this idea! After wondering if I could actually fit this into the TSW Challenge and looking at the themes that are coming up, I'm in for this challenge! 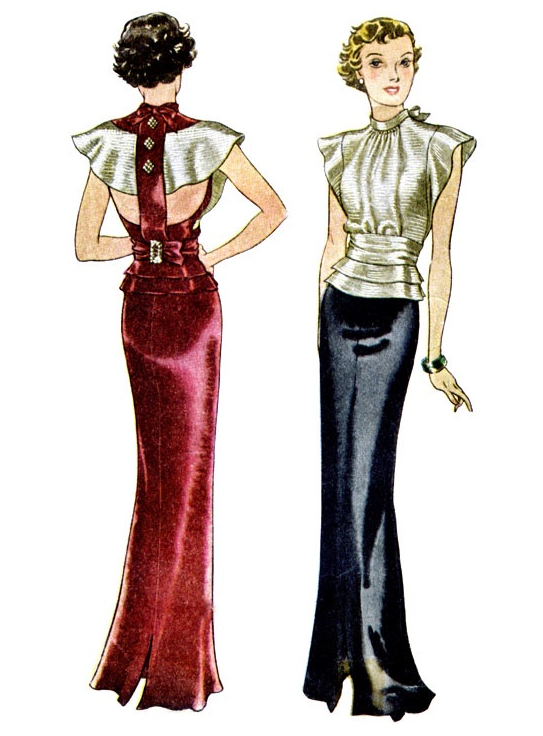 I would like to create at two outfits each from the 1930s to the 1970s in 2011. I'm flabbergasted, they had "hoodies" in the 40s??!!!!! That's the earliest one I've seen, I've seen tons of 40s patterns and never with a hood before, interesting. I am interested in joining you all. I appreciate that its quite late, but is it still possible to sew along. I have been thinking of doing something similar on my own, and this might jsut provide the motivation I need. 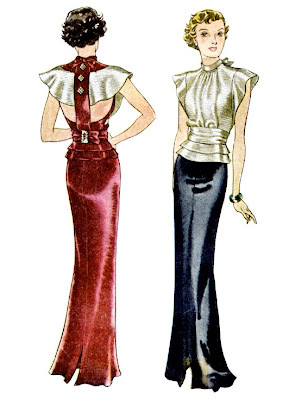 Uh, do you know if it is still possible to find the 1934 evening dress repro pattern somewhere?